On Saturday, June 21, 2008 Buddy Bike participated in the OASIS Autism & Health Point Walk/Bike-a-Thon to raise funds and awareness for autism. 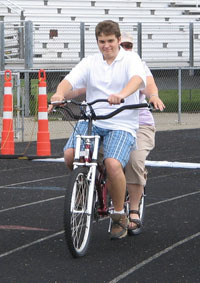 Several families were able to test ride the Buddy Bike but Coty and his Mom, Judy, enjoyed it the most. Coty is a 16-year old teenager that has overcome incredible odds. Due to his early childhood disabilities and the fact that he has outgrown his Mom, like most teenage boys do, Coty never had a chance to learn to ride a bike...until now. 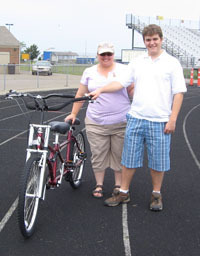 Coty rode the Buddy Bike with Shelley Patterson, Buddy Bike representative, and then with his Mom. But that wasn't enough. Coty had a look of determination and everyone could see that he wanted to ride the Buddy Bike on his own despite his usual shyness at trying new things in front of others. 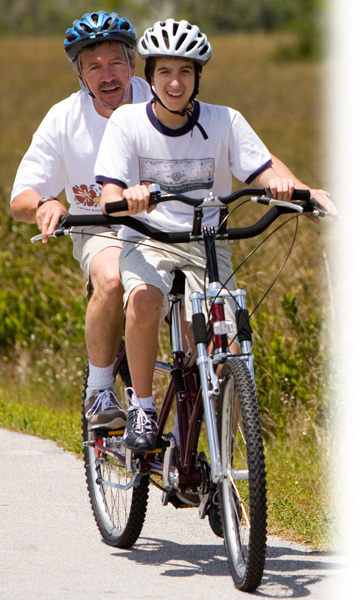 The Buddy Bike is longer than a standard bicycle and shorter than a typical tandem. It takes some getting used to for someone who does know how to ride a bike; but Coty was not discouraged. After some instruction and encouragement, he worked his way around the 1/4 mile track by himself. Mom said, "I'm trying hard not to cry!" Due to the generosity of a special family and Angel Thompson of OASIS Autism Coty and Judy now have a brand new Buddy Bike of their own. Hopefully one day they will be able to enjoy the bike with Coty's younger sister who is struggling to overcome disabilities similar to Coty's.